Will Pope Francis' encyclical reshape world's climate debate? Toward the beginning of his landmark encyclical, "Laudato Si'," Pope Francis writes, "I urgently appeal, then, for a new dialogue about how we are shaping the future of the planet." Yesterday, a dialogue was what he got. Reactions poured in from around the world to Francis' call for humanity to step away from a consumption-driven society that, in his mind, has caused the Earth "to look more and more like an immense pile of filth." 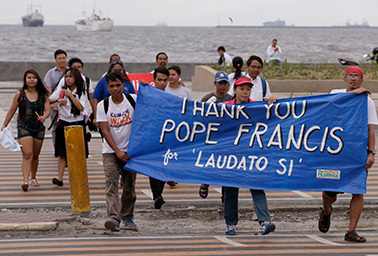 Environmentalists march toward a Catholic church in Manila, Philippines, to celebrate "Laudato Si'," the pope's encyclical on climate change. Photo courtesy of AP Images. President Obama issued a statement saying he "deeply admire[d] the Pope's decision to make the case -- clearly, powerfully, and with the full moral authority of his position -- for action on global climate change." Far on the other end of the political spectrum, Sen. Jim Inhofe (R-Okla.) blasted Francis' "urgent" call for a shift from fossil-fuel-intensive fuels like coal and oil to more renewable energy. "I am concerned that his encyclical will be used by global warming alarmists to advocate for policies that will equate to the largest, most regressive tax increase in our nation's history," he said in a statement. "It's the poor that spend the largest portion of their expendable income to heat their homes, and they will be the ones to carry the heaviest burden of such onerous policies." Francis used the encyclical -- one of the highest forms of church teachings a pope can issue -- to argue human activity has played a significant role in warming the planet. "Climate change is a global problem with grave implications: environmental, social, economic, political, and for the distribution of goods," he writes. "It represents one of the principal challenges facing humanity in our day. Its worst impact will probably be felt by developing countries in coming decades" (ClimateWire, June 18). Pope Francis' encyclical has energized environmental groups around the globe. But while he embraces renewable energy, he is deeply skeptical of one tool that's commonly used by governments and companies to lower carbon footprints: carbon credits. "The strategy of buying and selling 'carbon credits' can lead to a new form of speculation which would not help reduce the emission of polluting gases worldwide," he writes. "This system seems to provide a quick and easy solution under the guise of a certain commitment to the environment, but in no way does it allow for the radical change which present circumstances require. Rather, it may simply become a ploy which permits maintaining the excessive consumption of some countries and sectors." This analysis puzzled the International Emissions Trading Association, which has supported carbon trading in the United States, Europe and Asia. It replied with a statement: "The ... brief mention of carbon credits was out of step with the views of most economists and analysts." The group added: "Carbon markets are typically quite competitive, and they contain safeguards against the excessive speculation warned about in the encyclical. ... Through their cost-effectiveness, market approaches can enable more ambitious emissions cuts to be achieved -- and more quickly than cumbersome regulations." "I haven't seen anything like this ever, in terms of a papal document," said Dan Misleh, the executive director of Catholic Climate Covenant, referring to the intense worldwide interest in the contents. "I think this is going to be one of Francis' defining legacies, and one of the most important encyclicals" ever issued by a pontiff, predicted longtime church observer Anthony Annett of Columbia University's Earth Institute. The Vatican had to move the formal presentation of the document to a large auditorium to accommodate the swarm of press. And at one point yesterday morning, its website appeared to briefly crash due to the swarm of encyclical downloads. The big question, though, is what happens next, and whether Francis' global popularity will allow him to achieve his goal of helping direct international climate negotiations toward lowering humanity's carbon footprint. "Let me put it this way -- one of the things that is so attractive about this pope is his authenticity," said Misleh, who has spent years organizing American Catholics around environmental issues. "I think as a human being he speaks the truth, but he does it lovingly. I think people will be open to what he has to say here." "I don't think this is just going to go away," added Annett. "I don't think this is the 24-hour cycle. I think this is going to have legs. I think it's fundamentally going to change the conversation in church circles and outside church circles." But at one point, Annett described Francis' concerns about the modern, industrial, consumption-driven society as a "jeremiad," and, as Jeremiah himself found out, people often aren't too keen to hear jeremiads. In the encyclical, Francis singles out air conditioning as one example of "harmful habits of consumption." Misleh conceded that it may be a hard sell to get people to rein in their energy use. "It's going to be tough. All of us are guilty of consuming more resources than we probably need to." Mindful of criticism that decrying a consumption-focused society is akin to railing against the entire economy, the Vatican took pains to reach out to the world's business community during the run-up to and release of the encyclical. Yesterday's formal presentation panel included Dr. Carolyn Woo, a former dean of the University of Notre Dame's business school. "[The encyclical] actually invites businesses to be part of the solution, and reminds us that business can be a noble vocation," she said. "You know, a lot of people think of business as a necessary evil. This is an invitation to be a necessary good." "Nobody is suggesting a return to the Stone Age, but we do need to slow down and look at reality in a different way," Francis writes. "To appropriate the positive and sustainable progress which has been made, but also to recover the values and the great goals swept away by our unrestrained delusions of grandeur." Cardinal Donald Wuerl, the archbishop of Washington, D.C., cautioned against expectations that the Catholic Church will immediately turn into a full-fledged environmental advocacy organization. "We're a 2,000-year-old organization, and we've all learned that it takes a long, long time to get the message out," he said at a press conference yesterday morning. "There's always the temptation to read quickly a document and get something out of it, and the church is saying we're probably going to be studying this a long time and trying to engage people in the discussion for a long time. Maybe we ask ourselves a year from now, what came out of that?" Wuerl, who delivered one of the high-profile speeches reaching out to the business community in recent months, was cautious enough to decline to commit to whether he'll address the encyclical in his Sunday homily. "This is not an easy answer," he said. "This is not a quick-fix document."